Here you have a Hanger 9 HAN4210 Twist 3D ARF R/C Airplane Kit !! This is an ARF airplane kit, hardware and building manual only, no electronics or motor. This kit is complete and BRAND NEW~!! This plane has a 54.7 inch wingspan and it is 100% balsa and plywood construction, covered and ready to assemble. It is 56.6 inches long, has a wing area of 992 sq. 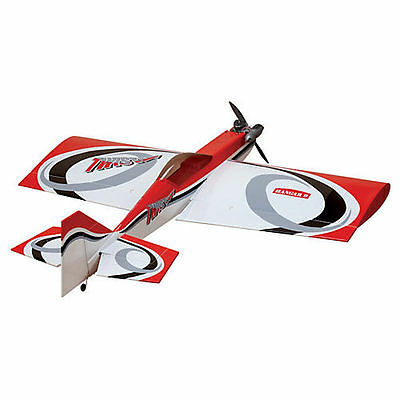 inches, it weighs about 6.5-7.5 Lbs, requires a .60-.75 two or four stroke nitro engine or it can also be powered with an E-Flite Power 60-90 brushless electric, or many other brushless electric motors and lightweight electronics !! Black & Red on the bottom (See Photo's). These exact Kits sell for $289.99 plus tax or shipping at any hobby dealer, and are Well Worth It ~!! Someone will get a bargain here !! These Kits are beautiful and easy to put together. This model can be equipped with nitro or electric power !! Photo's do not even begin to show the quality of construction, detail, and the beauty of the colors of this plane, it is Fabulous !! Again, please go back and check photo's thoroughly and you will see !! You can't go wrong here when you have this "All New Kit " with a low Purchase Price of only $220.00, you will get this Very Nice Color pattern for Great Visibility, and you buy now, you can receive it in just a "few days" !! !